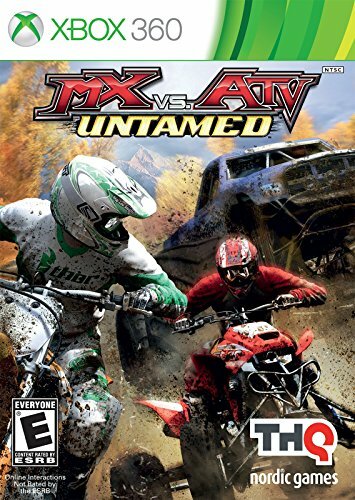 MX vs ATV Untamed kicks it up a notch and shifts into high gear! Attempt to own the off-road by dominating the innovative new “XCross Tournament,” which brings together 8 unique racing series like Endurocross, Open cross, Supercross, Waypoint and Supermoto and then crosses them into one ultimate off-road championship! Brand new styles of racing are born as powerful vehicles tear through treacherous trails in the new Open cross Modes, while then shifting gears to navigate boulders, logs and water pits in Endurocross. Players can take control of the new DRV Sport and multiple other vehicles, including Monster and Trophy Trucks, as they blaze through rivers, swampy everglades and the desert dunes. Amp up your favorite vehicles power, handling and acceleration with more than 100 sponsor parts and accessories.